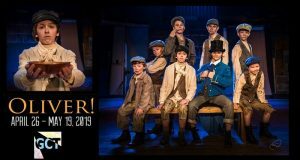 MARIPOSA – The Mariposa County Arts Council’s Theatre Alliance proudly presents “The Tramp and the Rough Rider” on Saturday, July 11 at the Mariposa County High School’s Fiester Auditorium. The show starts at 7 p.m. This highly acclaimed production written by Lee Stetson has been produced nationwide, and stars Stetson as John Muir with Alan Sutterfield as President Theodore Roosevelt. Tickets are $8 for Students, Senior Citizens, and Arts Council Members and $10 for General Admission. “The Tramp and the Roughrider” illuminates the extraordinary encounter between President Theodore Roosevelt and naturalist John Muir during a four-day camping trip in the Yosemite wilderness. The action unfolds at sunset on Glacier Point, overlooking the magnificent Yosemite Valley in May of 1903. Both of these characters were feisty and opinionated, and had sharp disagreements on issues like hunting, animal rights, and forest management. Muir’s poetic and evangelistic temperament clashing with Roosevelt’s political and boyish enthusiasms, naturally spawned tension and humor. Both skillful storytellers, it seems natural that both would seek to top one another by relating some of their many adventures in the American wilderness – Roosevelt bringing a frontier ruffian to justice, for example, or Muir telling of his hair-raising ‘interview’ with a Yosemite bear. At the time of this historic meeting, many millions of acres of our western forest, with little or no governmental supervision, were being exploited and abused by hunting, lumber, stock and mining interests. The federal government had established only five national parks and one small wildlife preserve and was without a Park Service. The Yosemite Valley, though surrounded by a national park, was controlled by the state of California, and was frowsy and neglected. But around the campfire, in sifting through their histories and their hopes, these very different men slowly discover how the other had been shaped by the wilderness they loved, opening up some rich possibilities of “doing some forest good.” And by the end of Roosevelt’s presidency, America could boast of an additional 200 million acres of forest wilderness, five more national parks, and 65 wildlife preserves. Bully! 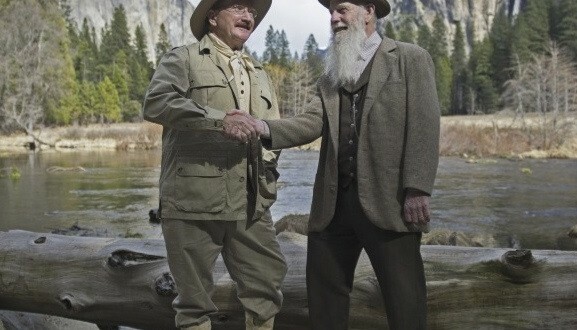 Whether you’re a naturalist, a sports-man, or both, you will be captivated by this passionate performance by Lee Stetson as John Muir and Alan Sutterfield as Theodore Roosevelt. In addition to “The Tramp and the Rough Rider,” Lee Stetson’s plays include three one-person shows based on the life of the naturalist John Muir. These productions with Stetson in the title role have been presented in Yosemite National Park since 1983 to more than a quarter of a million visitors. The Muir shows have toured throughout the country to universities, parks, museums, wilderness and environmental organizations from Washington D.C. to Hawaii. Stetson lectures frequently on the arts and the environment, and spends a considerable portion of his time promoting the performing arts in the national parks. 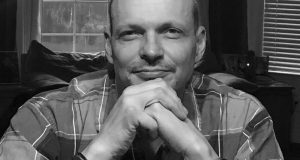 His career has included founding and managing the Hawaii Performing Arts Company, being the Artistic Manager of both the Hawaii Theatre Festival and the Antique Theatre Festival of Idaho, and freelance directing throughout the Northwest and in Los Angeles. As an actor he has performed more than fifty major roles from Shakespeare to Simon, and his television credits include a dozen episodes of Hawaii 5-0. Alan Sutterfield has been an actor and playwright for many years, both in Hawaii and on the mainland. Recently he has played leading roles in James Joyce’s “The Dead,” “The Importance of Being Earnest,” and “Laughter on the 23rd Floor”. Along with Theodore Roosevelt, Sutter has portrayed many historical characters including General Custer, Captain James Cook, and John Merrick, The Elephant Man. 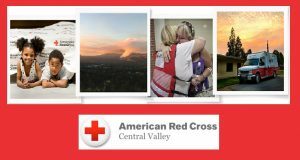 The Arts Council, is an incorporated not-for-profit organization, created to promote and support all forms of the cultural arts, for all ages, throughout Mariposa County and is supported in part by the County of Mariposa, the National Endowment for the Arts, a federal agency, and the California Arts Council, a state agency.